How to add a PdfView control to the Toolbox? Patagames Software Support Forum » Pdfium.Net SDK » FAQ » How to add a PdfView control to the Toolbox? I installed the Pdfium.N0et SDK with the nuget package manager, the DLL is loaded into my project, but I cannot find this PdfViewer item in my ToolBox in the designer view. NuGet is focused on installing libraries and tools into a Visual Studio solution. It does not explicitly install anything outside of that folder such as UserControls into Toolbox, so you must do it yourself. Open the form file of your project's main window in the Designer. For example, it would be MainForm.cs or UserControl1.cs. In the Toolbox, select the tab where you want to add the control. Right-click the Toolbox and select Choose Items from the shortcut menu. The Choose Toolbox Items dialog box opens. The below picture shows the Choose Toolbox Items dialog box. 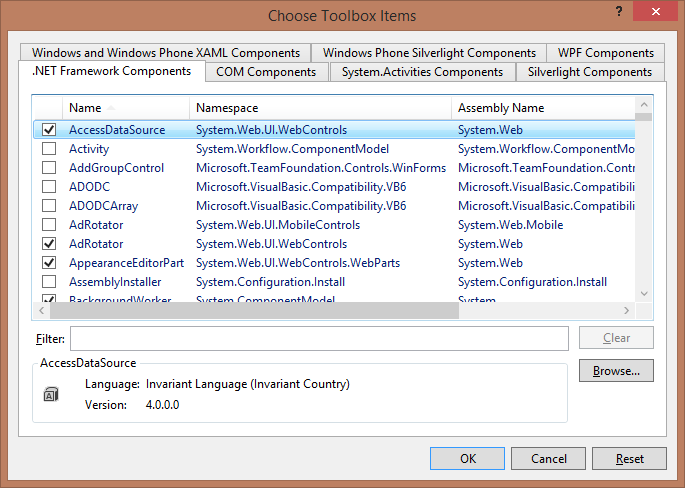 Click the .NET Framework Components tab. Click the Browse button. In the Open dialog box, navigate to the Patagames.Pdf.WinForms.dll assembly, select it and click Open. Put a check mark next to the control, and then click OK. The PdfViewer control appears at the bottom of the selected tab in the Toolbox. From the Toolbox, drag the control onto the design surface. The PdfViewer control appears on the design surface. Right-click the Toolbox in the empty area underneath and choose Add Tab to create a new tab. Name the tab "Patagames UI for WinForms". Open a Windows Explorer and locate the Patagames assemblies folder.